Precision Escalator prides itself on its outstanding service to its customers. Our quality products coupled with our highly-trained, intelligent, and caring staff put us above all the rest in terms of impeccable service. Precision’s education efforts continue by sharing information from our Expert Engineers. Their extensive knowledge, advice and direction can help for a wide variety of your refurbishment and repair efforts. Precision’s Virtual Escalator is an excellent learning tool for safety and operations. We share this to help you, your employees and our worldwide escalator customers, as a great safety and operations teaching tool. Precision Escalator is an Equal Opportunity Employer. If you are interested in a career with Precision Escalator, please send us your resume. Our PRECISION manufactured, quality parts are repeatedly proven and tested daily, in North America and all around the World in the International Capital Cities with most demanding and punishing 24Hour-7Day high traffic Public Transit environments. PRECISION, serving the industry for over 20 years, believes our Expert Engineers should always directly discuss each project with our customers. Each escalator and elevator modernization project is very unique, has many options and can comprise hundreds of individual parts. Please Call Precision directly, we can show you complete parts solutions and all your options for your upcoming project deployment. In the attached pages, you will find some samples of the thousands of parts, products, and components that Precision manufactures in our custom fabrication facilities. It’s really best to call us directly, so the Precision Engineers can address your project and structure all elements of a complete end to end solution that can get your job done right. 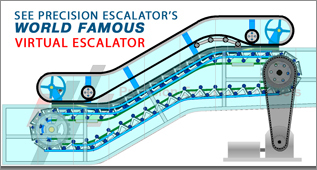 Please click here or on the picture below to see our World Famous PRECISION VIRTUAL ESCALATOR. PRECISION provides parts and components for our different types of customers. Some larger installations can have escalators and elevators from many different primary manufacturers in a single building complex. PRECISION can be a one stop business partner providing complete end to end replacement parts solutions for all of these systems. Precision Expert Engineers at our factory can consult via telephone conference calls with all our customers, (above) certified mechanics and onsite managers, to determine replacement parts needs for current projects and job repairs. IMMEDIATE ESCALATOR PARTS NEED? – PRECISION is your Escalator & Elevator parts rush order specialist, solving your critical parts requirements ASAP to exceed your owner’s demands and service availability contracts. PRECISION Engineers offer immediate customer service – If you don’t instantly see the Escalator & Elevator Parts you need to get your job done, please immediately call our System Engineers. We can help you find exact models of your replacement parts. We can extensively discuss your repair service project plans, replacement parts solutions, & part refurbishing requirements. PRECISION provides parts solutions for major project plans to help achieve your repair deadlines. With our 20 years of quality industry experience, we strive to be your premiere escalator parts and elevator parts partner by offering your service organization the largest inventory of Escalator Parts & Elevator Components solutions. Our 90,000 sqft State-of-the-Art custom machining and urethane factory allows us anticipate your in stock repair requirements & service schedules.